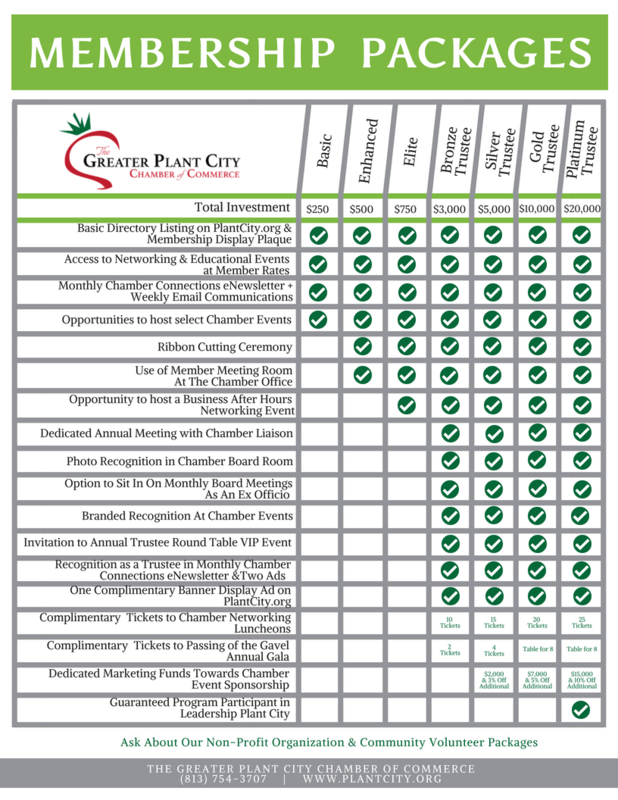 New membership options are coming to the Plant City Chamber of Commerce beginning June 1, 2018. This new structure focuses on providing increased member value for Chamber members so that the Chamber can continue to foster an environment that is pro-business here in Plant City. On each member's renewal date, a letter will be sent explaining the new investment structure in detail and the new options available. Instead of paying dues based on the number of employees businesses have, members will now be able to select a membership package, a la carte, based on the benefits that are important to them. Q: What if I'm already a Plant City Chamber member? Am I going to be paying more? A: Current Chamber members will be sent the revised membership package on their renewal date. From there, they are free to select a new package based on their desired visibility and involvement. While there is the opportunity for investment, most members will be paying a similar amount with the new tiered structure. Q: Will I still be able to do a ribbon cutting? A: Yes, all Enhanced members and above will be given the opportunity to host a ribbon cutting within the first three month of joining. Basic members can host a ribbon cutting a la carte for an additional $100. Q: We're a non-profit organization, how much is my membership? A: The member rate for non-profit organizations has remained the same - $150. Non-profits will be granted the same benefits as an Enhanced member at this reduced rate. Q: I'm a trustee, what are the "dedicated marketing funds" for? A: Included in the silver, gold, and platinum trustee packages is a built in marketing budget for Chamber events. This budget allows you to select the Chamber events that you would like to represented at and invest accordingly. The sponsorships are built into your trustee dues, so you simply pay your dues and then select which Chamber events you would like to sponsor. Once you've allocated all of your budget you may choose to invest in other events at a discounted rate (3%, 5%, or 10% respectively).